The first paragliding, paramotoring and ultralight aircraft facility in the Visayas opened in Danao, Bohol, Philippines with Vice President Jejomar Bnay cutting the ceremonial ribbons. That same day the morning was filled with spectacular shots of two paragliders buzzing overhead, swooping down and then performing shallow sweeps with their parachute wings. When paragliding or paramotoring, a motor is attached to a parachute carried by a pilot who launches the craft standing up, and uses only a little bit of strip. A small engine mounted with propellers and carried on the pilot’s back drives the paraglider to make ascents or sustain its turns. There is a similar facility in [Clark] Pampanga, but this is the first in the Central Philippines region, said Danao adventure facilities consultant Neil Pilongcos in an interview. 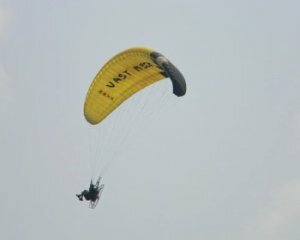 Flown by Civil Aeronatics Authority of the Philippines (CAAP) certified paraglider pilots, another variety of the paramotor is the tandem which allows a pilot and an extra passenger to fly on a four-liter per hour engine. Put up as the newest ride in Danao Eco-Adventure Park, Bohol, para-motoring is launched off a facility funded by the local government. Confident of the public private partnership scheme proposed for infrastructure development projects in the country, Danao Mayor Thomas Louis Gonzaga entered into a joint venture agreement for the project called Air Danao: Paramotoring and Ultralight Facility. The LGU put up a kilometer long air strip and funded the purchase of ultralight planes while investors pooled in paramotors and the technical expertise on running the facility. The long term plan, according to Gonzaga, is to put up a paramotoring flight school while catering to the expatriates who are into the hobby, said Pilongcos who is also a licensed paramotor pilot. For the project, Danao put up a kilometer long dirt airstrip for the tandem and the upcoming ultralight aircraft which the town will acquire. At the launching ceremonies, a golden yellow and white in navy blue paramotors buzzed overhead creating stark contrast with the blue skies. The paramotor operates on the theory of parachutes; it’s just that a motor helps the parachute attain enough speed to soar, he said. When landing, the paraglider can settle gently on any surface, in the middle of fields, even in the trees as long as there is enough clearing.